Phonte’s 2nd studio album ‘No News Is Good News’ was released on March 2, 2018, via his label Foreign Exchange Music. I do believe this project is his best release to date! In this video I share my thoughts and some of the themes on the album. A few of the themes I picked up on were introspection, health, growth and love. I also take a moment to explain why ‘No News Is Good News’ is so important for the culture! FAVORITE TRACKS: CHANGE OF MIND FT. FREDDIE GIBBS, EXPENSIVE GENES, PASTOR TIGALLO. The 2017 Beats N Bars Festival is two weeks away. The annual event is presented by The Underground Collective and takes place in downtown Durham, NC. This year’s lineup is incredible and includes G.O.O.D. Music’s Cyhi The Prynce, Nitty Scott, as well as many local favorites! The theme is “Building Stronger Communities through the influence of Urban Culture and Music”. In addition to the awesome performances there will be panels, one-on-one conversations with the headliners, live podcasting, graffiti sculpture workshops plus so much more. 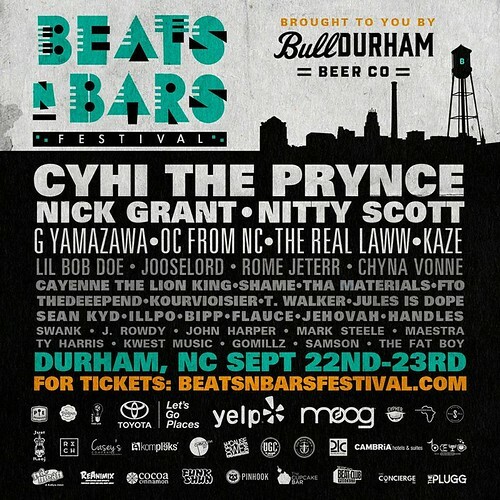 Y’all can visit the Beats n Bars Festival Eventbrite to purchase tickets, view a full listing of events throughout the weekend and receive more information. Cyhi Da Prynce Interview with Nanci O. 2015 #AOCFest: Art Of Cool Festival (@TheAOCProject) Review: The Top 5 Coolest Features (Video). In this video I give a review of Jay Z’s new album 4:44, his 13th album. The project was released June 30, 2017 on Roc Nation. I’ve been a fan of Jay-Z’s business moves and growth for several years. When I first started listening to Hov, my mindset, focus and goals were way different then they are now. Back then it was about partying, having fun and getting into shenanigans with my friends. These days I still love having fun but my goals are also geared towards financial literacy, wealth, wisdom, career growth, legacy, family and much more. It’s good to hear that Jay Z’s music has grown as well. The thought is that no one should be the same person they were 10 years ago. Growth and wisdom are key. No I.D. handled all of the production on ‘4:44’ and includes samples from Donnie Hathaway, Sister Nancy, Nina Simone, Stevie Wonder and more. Although I did this review over two weeks ago, I am still processing the album. There’s more to learn and understand however I do believe ‘4:44’ is an important piece of art for the culture. Check out my review of the album above! Moncks Corner, South Carolina native and media personalty Charlamagne Tha God released his first book last week. In that short time, it has become a New York Times best seller. I’ve been a fan of Charlamagne’s personality for several years. While at many times controversial and downright irritating, he comes across as brutally honest. Black Privilege: Opportunity Comes To Those Who Create it details Charlamagne’s SC roots, how he got his start in the industry, the super highs and the low lows plus more. Most interesting is I found the book to be extremely funny, spiritual, deeply inspiring and full of hip hop quoteables. In a nutshell, I loved it. Check out my review of the book above!